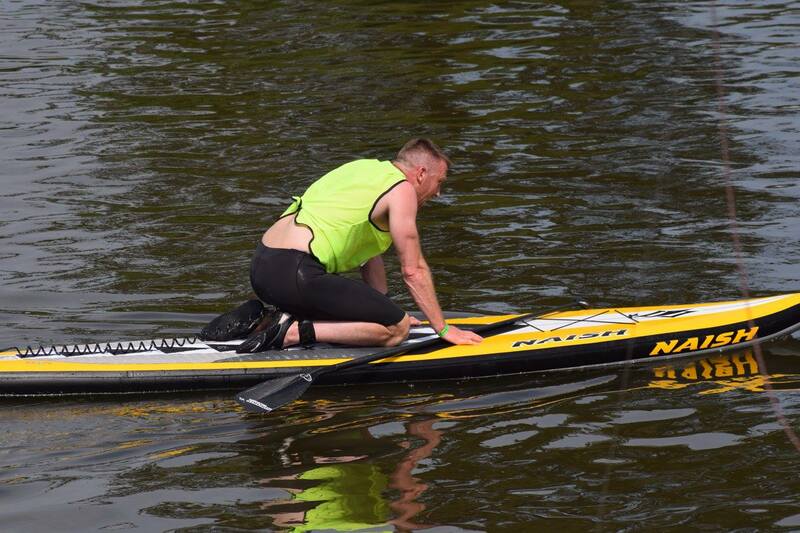 After the cut and thrust of being in the 14ft class last year, the race this year marked my debut for the Naish UK team in the N1SCO one design class at the Battle of the Thames event. I probably should explain why I feel a N1SCO race is completely different to 14ft racing. It’s mainly due to a combination of factors. The first is that the Naish One board is wider, inflatable and requires a lot more energy to accelerate quickly. Without boring you with the physics, the boards size and shape means it requires much more powerful and decisive conviction when you want to make a move because the level of resistance that is holding it back is far higher than that of an ultra-narrow and longer race board. If you don’t commit aggressively, not only does it take an age (best measured by watching paint dry) to make a pass but all you’re then doing is providing everyone else a really pleasant passing draft train for them. As a result, the racing is closer and company is common. The second factor is that the boards are wider than most boards at 30 inches so start to favour raw fitness more than requiring the balancing skills of a ninja (particularly good for me since I do like to train and more fundamentally because I have the balancing skills of a blind cow on ice). 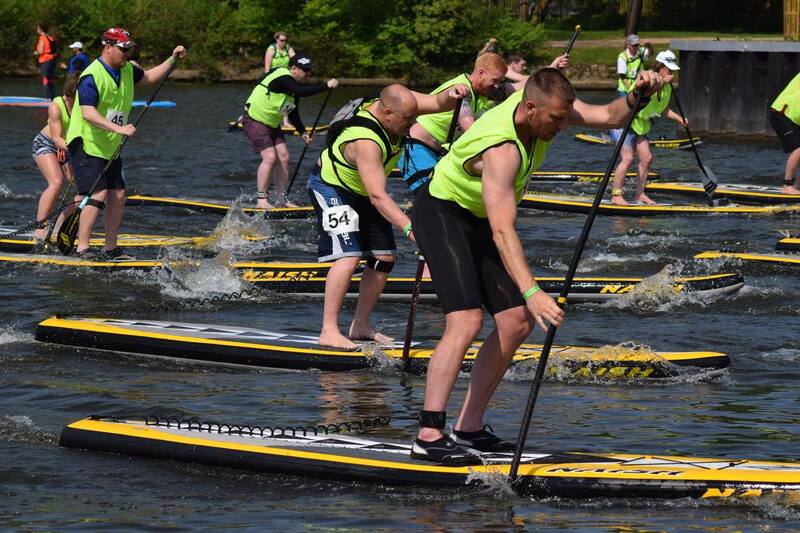 This is a good thing because it builds confidence to anyone with an interest in SUP racing and gives more standards of paddlers a panic-free foothold into the sport. The final factor was its outright popularity at this year’s event. Big numbers of participation this year (that numbered well over 40) meant it was the biggest race fleet there. The sheer mass of us on the start line resembled a black and yellow therapy group of enthusiasm that I would have spent much more time soaking up were it not for the fact that we were there to race (and the fact I nearly went for an early swim because I somehow failed to spot a gigantic bright red inflatable gantry which marked the finish line). This year the start order had been rejigged and whilst there were concerns elsewhere in the field that other classes would get mixed up and have draft trains on offer that would be too tempting for those of dubious ethics, the plus for the N1SCO fleet was that we would get calmer waters to start in (which was good as last year, the cross wake was so severe, my ability to stay upright resembled that of a drunk at a 90’s rave). The key issue for me was that I didn’t have the slightest idea to know how I was going to figure in the race. I’ve raced enough in the 14ft class to know when I’m on a good day but a combination of a winter spent focusing on my paddling and being in a new fleet entirely meant I had no idea whether I would be fighting for glory at the sharp end or pleading for help at the rear. This all said, at least I was actually on the start line for a change rather than being late (last year), facing the wrong way (last month) or unable to start until half of Devon had paddled away (last race). The gun went, we all got going and I decided to take the option of staying out of the main pack in clearer and calmer water. This would waste a bit of energy and I realised that leaders Alex Tobutt and Stuart Appleby had both gone out hard but I was confident that even if my paddling technique can resemble a panicked sea gull, my raw fitness was going to make a guest appearance before the bar closed. Back at the front, the pace started to settle down to something my shoulders declared was reasonably sane and I quickly started working my way up the field. I then passed the ever beaming face of Sam Wood and I was grateful he decided not to beat me to death with his paddle (relating to an event when I took him out in a rather enthusiastic sprint finish on the sand at last year’s national championships). By this point, Alex and Stuart were working really well in the lead and I suspected were both intentionally sharing the workload up front to stay clear. I opted to shut the gap down at this point before anyone suspected I actually thought I knew what I was doing. Doesn’t get much closer than that, 1 second for first place. Image Sarah Thornely. Bryce and Alex after their sprint for first. Image Sarah Thornely. It had been said beforehand that there would not be much river flow that day but they were wrong. I thought perennial N1SCO podium attender Pete Vale was auditioning for ‘Gardeners World’ at one stage when I saw him ploughing through overhanging branches that lined the river became he’d been smart enough to spot the advantage by hugging the river bank rather than straying even a metre or two further out. This presented me with a bit of a problem. I’d already planned beforehand to strike out on my own from around 40 minutes from the finish line but this flow (coupled with the occasional headwind) was creating a racing line that was too narrow, would require too much energy to get clear and provide too much opportunity for others to draft if I felt frisky. Instead I was going to have to leave it until the final bridge which I knew would then only leave me around 20 minutes to try and break the draft train up. If I could break up the 4 of us that remained in the lead group, I fancied my chances with a straight time trial but I didn’t fancy the complete unknown outcome of a bunch sprint. 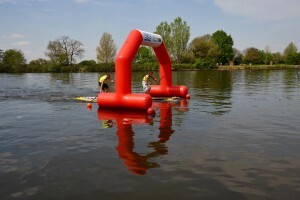 However, the final buoy turn brought the full downstream width of the Thames into play as a racing line. I then uncorked things and I felt my best option was just to incrementally lift the pace and head for home. I also decided also to spice things up by using a passing paddle steamer to help create a bit of tactical uncertainty for everyone else by cutting it close and making the rest choose which side to pass. A bit of graft shed 2 of my companions. That now just left me with last year’s series winner Alex to contend with. Now I didn’t know much about the ability of anyone in the race but I did know that Alex is one of the best sprinters around in any board class, let alone this one. In cycling tactics 101, if you’re in a breakaway, it often makes sense to force the better sprinter onto the front to get them to do the work rather than succumb to the inevitable loss. However, I knew I had more to lose than he did because if I slowed down, there was a good chance that would let the other 2 behind us to re-attach whereas he could still remain confident of his proven fast finish. So I decided to keep the speed as high as possible to make it as hard for him to pass as possible (and there’s an old saying in track cycling of ‘if in doubt, lead it out’). Besides, I had been moving the board at well over 9Km/h for 20 minutes at this point and still felt strong so I felt pretty confident that I could hold him back. My shining light of confidence came unglued though as I drove for the line over the final metres. 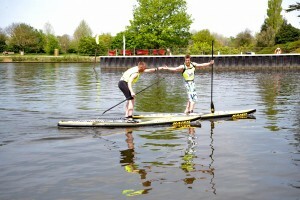 Alex had switched to a high cadence, choked down paddling style and timed his finishing sprint to absolute perfection. It was an inch perfect masterclass of board sprinting and you felt you had to marvel at the skill and power on display (had it sadly not been at my expense). The end result was 2nd place which I was pretty happy with bearing in mind the uncertainty of my first N1SCO long distance race. Still the bigger grin for me resulted in that on a day when the majority of people went slower than last year’s efforts, if I extrapolated my own time out to the full 10 miles I did last year and accounted for a bit of fatigue, I would have beaten my effort from last year when using a longer, narrower and faster board by nearly 10 minutes, so I had to be pleased to see that 5 months of training had finally started to pay off. As always, thanks to my supporters in 2016 and these include Naish UK, FC Watersports, Quickblade paddles, The SUP Hut, Nielsen-Kellerman and Red Venom compression wear.